As the profession of art expert is not regulated, all artists and professionals can write a certificate of authenticity. ARTcertificate considers that the author of the work is the person most competent to establish a certificate of authenticity especially during the first sale, the gallery owner or a professional can also contribute to this operation. It is nevertheless necessary to respect certain criteria when editing a certificate in order to give it an optimal authentication value. 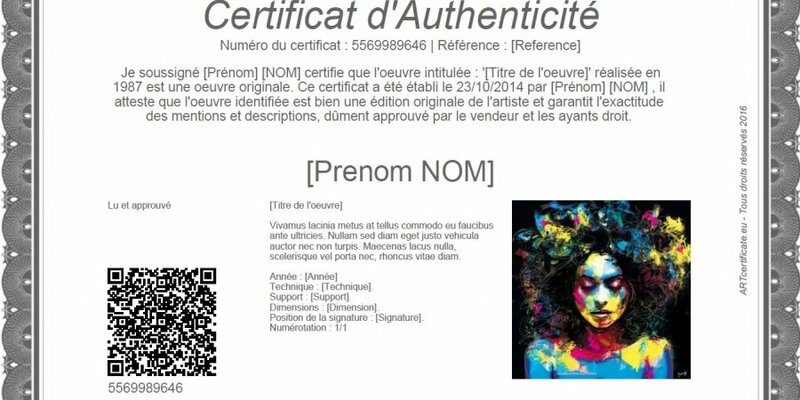 A certificate of authenticity is a legal document that proves the origin of a work of art, guarantee that the indicated print is never exceeded and that the realization is of very high quality approved by a recognized gallery. The certificate of authenticity is always signed by the artist during his lifetime, or by the representative of the artist. No recognition in a catalog raisonné of the financial value of the work. Without a certificate of authenticity, it is impossible to evaluate the work, its only value depends on its size, technique, materials used and the subject represented. The additional certificate of authenticity is offered starting from € 1.45 each, your advantages: a saving of time and an immediate result.